Foreign Language Movies – Dubbing vs. Subtitling. Sammelband von Angelika Goldstein & Biljana Golubović (eds. 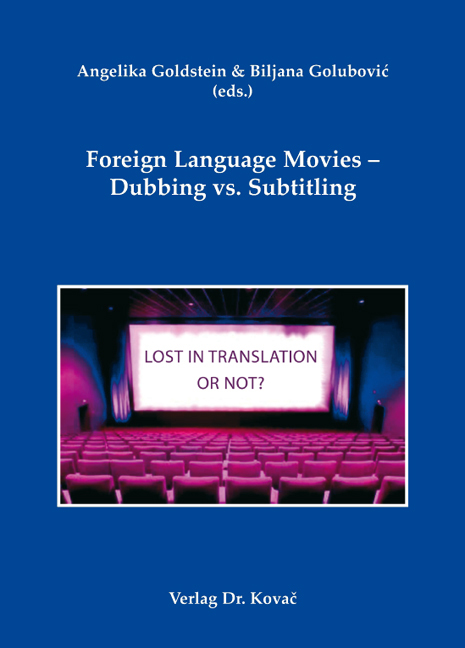 ), Verlag Dr. Kovač 2009, 228 S.
The subject of this volume is motion picture translation, that is, theories, methods and results of research aimed at various aspects of foreign movies and the implementation of motion pictures in foreign language classes. This collection of papers on the translation of motion pictures consists of 15 contributions by authors from Europe, Canada, Australia and Asia, who all deal with this subject as part of their work in research and academia. Included are papers in the English, German and Serbian languages. Contributions may be classified into four wider thematic areas: theoretical foundations and other considerations; research on dubbing and subtitling; the audiovisual landscape in different countries as well as foreign movies and language acquisition. Apart from the thematic diversity, the volume is also characterized by its scientific and methodological diversity; therefore papers vary from general review papers to descriptive works dealing with certain subjects and to empirical analytical studies. An assortment of subjects, different scientific approaches, a wide variety of countries in which motion pictures are translated, as well as different origins of movies that are subject to analysis represent a special value for this book that, apart from offering answers to many questions, tends to point to uncharted terrains and open questions within the field of motion picture translation and its use in the process of foreign language acquisition at the university level.